While the Man of Steel may have saved the world a number of times, He was helpless when he found a piece of kryptonite blocking the pipeline. For all his strength and laser shooting eyes, He couldn’t get the kitchen sink to work and there was only one person who could solve this crisis. Wishup. Gotham might be a haven for criminals but the government is extremely particular when it comes to The tax laws. Now Bruce Wayne, the billionaire who “ahem” followed law did not have the time to file taxes. Who would attend those glamorous parties and answer the bat signal? So He used the Wishup and thus Tax bot became the unknown sidekick of Batman. PS- Even Joker used Wishup. I guess he wasn’t that bad now was he? The fastest man might be have a smooth sailing on the roads but he ain't that smooth when it comes to pursuing his crushes ( Did he confess his feelings for Iris yet?) Cisco Decided to help his friend out and sent a single rose flower and her favorite vanilla cake in the name of Barry. Ultimately Barry was brozoned and not to mention Cisco ran faster than the speed of light to get away from The Flash’s wrath. PS- Cisco decided to name our bot Botanist. The Chosen one can create everything out of his ring but there is one secret that about him that only we know. Other than his passion for flying, he is a big foodie and despite conquering the Yellow fear and all his insecurities, he cannot cook food. Since green food coming out of his ring wasn’t so tempting, he decided to use Wishup. Let's just say Wishup would have been Mrs Green Lantern if Hal Jordon had his way. No matter how advance Jarvis is, No one throws a party better than Wishup. So Tony contacted us to celebrate his victory. PS- Tony getting drunk and blowing up places is not pre planned. So Thor decided to stay on earth with Jane but the Prince of Asgard cannot stay here without his luggage, right? Do you expect him to wear the same cloak everyday? ( yes he has duplicate clothes. 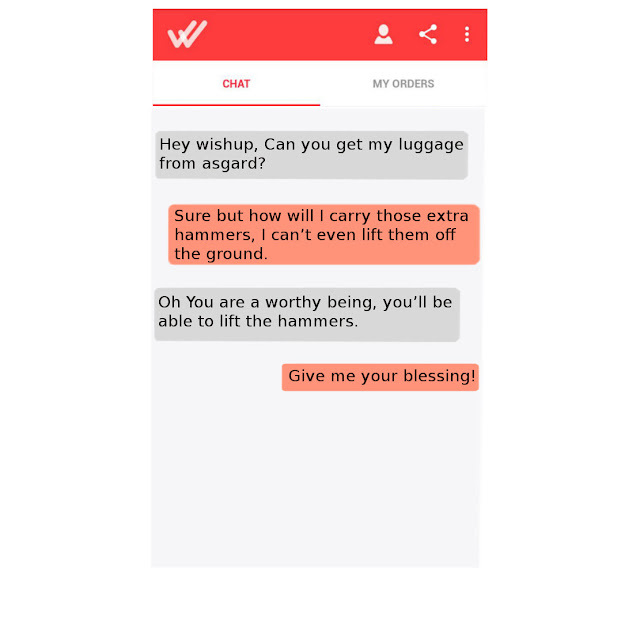 Yes he uses the laundry bot to get them washed) So, he asked wishup to provide the taxi service to get his luggage from Asgard to Earth. Yep, we fulfilled the wishes of a god. ( it felt nice to turn the tables). Yep, With great power comes greater responsibility. Suffers from hyper active syndrome, fiddles around with things, still figuring out his way in life, wants to change the world. May not fit into the conventional idea of a writer but doesn’t shy away from playing around with wild ideas.